With countless customisation options, plastic business cards are the ultimate way to create an unforgettable first impression. Unlike cardboard business cards, plastic cards are long lasting and can survive the trials of a wallet or business card holder without looking tattered or becoming unreadable. The biggest advantage of plastic business cards? The choices! Customising your card is fun, and it’s our job to make it easy for you. With 25 years of experience, our team can provide expert advice on which options would suit your business goals. From the look and feel to codes, tracking and branding, we will find the right design to match your goals. 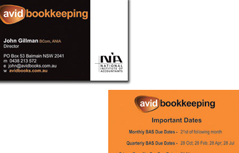 Looking to take your business card to the next level? 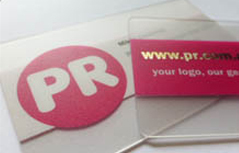 Really want to stand out when your card is handed out, A Custom Printed Plastic Business Card from PR is the way to go. Clear of Frosted business cards is by far our most popular option. If you are looking for a clear or frosted look, then we can help. To be honest, we like the clear and frosted option so much, we use it for our own business cards, and whenever we hand them out, they always spark conversation. Do you run a premium business where the only the best will do. Then our Silver or Gold Metallic Plastic Business cards will be perfect. The material exudes a sense of sophistication, a level above the standard. Another great option is to add a silver or metallic foil stamp. 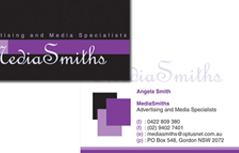 We would highly recommend Mikel at PR Design to help you with your card printing and accessory needs. We ordered 6 varieties and over 10,000 cards. He was only a call away, always on hand to assist, gave prompt updates and kept us on target with delivery time and within our price range. He beyond exceeded my expectations. Just wanted to let you know that we got the cards today and they are spot on! Thanks so much for making this an easy process. I will look forward to working with you in the future! Just wanted to let you know that the cards showed up this morning, and they look FANTASTIC!!!! We are extremely happy with them and the boss is stoked. So I expect we will be back again for a re-order when we run out. Thank you again for all your help and patience. As first time customers of PR Design, our club has been very impressed with the customer service, price and quality of our finished product. Mikel was easy to deal with and any question or information requested were promptly answered. Thanks Mikel, it was a pleasure doing business with you and your company. Highly recommend! We are happy returning customers as Mikel provides fantastic service and great quality items at competitive prices each and every time. I would have been the customer from hell! I didn’t have a clear idea of what I wanted, but needed it completed in a hurry. Mikel was so patient and helpful – he worked through it all with me and helped us get something that was perfect for our needs. It was all done with a minimum amount of fuss and maximum speed and efficiency. The price was unbelievably good and although it was a relatively small order I was treated with an enormous amount of respect and courtesy. 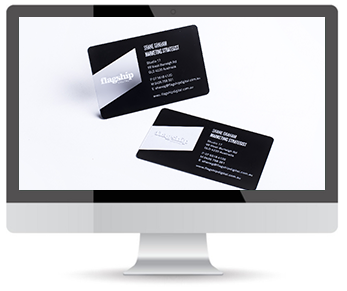 We have been using PR Design for five years to produce our membership cards and we find the service provided is efficient and the delivery of our requirements is simply achieved. We will be using PR Design in the future and have no hesitation in recommending their services. Thanks Mikel and the team at PR Design for helping us with our cards. The end result is fabulous. Our cards look and feel so professional. You were great to work with. Efficient, professional and very fairly priced. And thanks for picking up some mistakes in our artwork too before they went to print ! I really appreciated that (you have great attention to detail). I used PR Design for the first time to print 1000 plastic cards that we use for a Rewards program. I was pleasantly surprised by the quality of the product, given the PR design was the cheapest quote that I received. Mikel kept me up to date with the progress of the order and it was delivered as promised! I am very happy with PR design and will not hesitate to use them again. The ordering and delivery of 27 versions and over 57,000 pieces of plastic loyalty cards from PR could not have been made any easier. The price was right, the service was excellent and the finished products were fantastic. As a first time customer of PR, Mikel exceeded my every expectation and I will be recommending his services to my professional colleagues. Thanks for a great product and fast turnaround. The cards arrived this afternoon and they are fantastic. Thanks very much they will make us look very professional when we hand them out. Love the Mentos. Fantastic cards that look great and are exactly what we required. Prompt and efficient service, a great price – we’ll be back! Just want to let you know that we have received the cards and they look great! Just as intended. Thanks again, we will be using you for all future card printing. Mate just letting you know we received the referral cards weeks ago, and just wanted to say thank you for the work you did on them they turned out awesome! Cheers, I have passed your details to a couple of the other One Agency owners for you. Kerri Cryer – The Angry Sea Co.
As soon as my artwork left my hands, it arrived back in lightning quick time in the form of 1000 top quality plastic loyalty cards. With such a quick turnaround time, efficient service, great communication (which is so important when the promotion of your company is at stake!) and not to mention a very cost effective price, I would not fail to recommend Mikel and the team at PR Design. They were so efficient I wouldn’t hesitate to contact them for all future branding merchandising requirements! Such a pleasure to deal with, service was 100% in both time delivery of goods and product expectations, better than imagined! Great work and just a pure delight to deal with. Hope to do business with you in the future, and would not hesitate to tell everyone about your services and skills. Impressed with customer service, quality printed plastic cards at a great price. Impressed with early delivery as requested in the Christmas – New year festive season. Thank you PR design team. After only a short amount of time, I have received the 250 plastic business membership cards I ordered from PR Design. The pricing was a pleasant surprise, as it made them really affordable. The finish of the cards I received well exceeded my expectations, they are very professional – just like a well finished, high quality credit card. I am also extremely happy with the service and delivery time, Mikel’s help and patience made the whole process a pleasure. I would thoroughly recommend him and PR Design for plastic cards as well as their promotional items, the samples I received were fantastic and I will be looking to incorporate more items into my marketing. I have looked high and low over the internet for a product that was cheap, but the quality did not suffer. Mikel from PR delivered on that promise and the end product was great. We are only a small cafe who wanted to raise its profile with quality gift cards and the service from the PR Team was great, we were treated like one of the big boys. Would highly recommend PR and will be definitely be coming back. I just received the cards today and they look amazing! I was actually blown away at the quality and service that you have given our company, I hope that you don’t take this lightly. I have been in the printing industry for over 23 years and there are not too many companies that have made my eyebrows rise with delight. Thanks again for your service and will be using you again. 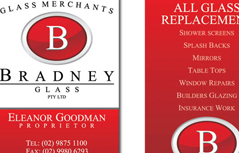 As a footy club we found it difficult for time to arrange to get our 2013 member cards ordered and Designed in time for the season commencement. We can not thank PR Design enough for their efficient And helpful service in regards to getting this organised and delivered in such an efficient time frame. The Cards look fantastic and are of fabulous quality. We look forward to working with you again next year. We have received the plastic cards in the mail today. Thank you very much for the prompt delivery of the products – it was totally unexpected and we are very happy with the finished product! The cards arrived a week earlier than you had promised! Cards arrived today and look fantastic!!! Sorry I didn’t get back to you earlier, it’s such a busy time. Yes the loyalty cards turned out beautifully, thanks very much. We have been very pleased with the service delivered by PR. After asking for many quotes, it quickly appeared as the best value proposal. Despite very short notice, the cards were received on time and are now working perfectly. Mikel and his team were also very helpful in solving issues we had with our scanning system. We would highly recommend PR for any corporate needs. As first time customers of PR, we have been more than happy with the fast and efficient level of service offered right through to the finished product. Mikel went out of his way to supply us with a top quality product at a highly competitive price. We will most certainly be using PR again in the near future and would highly recommend them to anyone who wants a great value product without compromising on quality and customer service. I have received my key tag order today. Thank you for your great service, the key tags are fantastic quality and I am very happy. PR was very professional, very helpful online in regards to the design process and the delivery process was very fast! I will be using PR again for other promotional items and I want to thank them for the great work. Overall, I am extremely happy with the service and product that PR provided. I received my cards yesterday and just wanted to let you know I am very pleased with them. Thank you. Just received our shipment of 500 x plastic membership cards (key tags)…. fantastic product! PR was easy to deal with, competitive prices and reasonable production/delivery time. Will definitely be using PR for future needs. The fast and efficient server provided by PR to design and deliver our membership cards has fully justified our decision to select them. We are more than happy with the service offered throughout the entire process from design to delivery. PR has supplied a quality product at a highly competitive price and would recommend them to anyone who wants a great value quality product with great customer service. Thanks Mikel. Our truck rental company had been needing to replace the key tags for a while. They look fantastic. Your service was impeccable and I will recommend PR to everyone. Received the cards today. I would be happy to write a testimonial, as we are pleased with the service you have offered. PR recently printed some loyalty cards for one of our campaigns, they did a great job and will be sure to use them in the future. Awesome service. 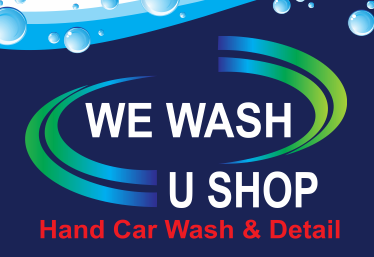 Very fast, efficient, excellent service and at the best price. I ordered some loyalty cards for my company, got told the date that I should receive them and then received an email three days before this date to say that they have arrived and been sent to me and I received them that afternoon. Thanks PR. On researching different printers to provide my recruitment company with business cards I came across PR. After speaking with other printers I decided to go with Mikel due to the fact he was very knowledgeable within his field and was able to suggest different designs and materials that would best suit our logo and colours, and most of all he was extremely prompt with all communication. The business cards arrived before the agreed delivery date and I will be using PRs again when it comes to a repeat order. Mikel at PR has been a pleasure to deal with. His service, communication and prompt delivery has been second to none. Thanks to PR “The Rhinos” have a fantastic membership card that looks great and I am sure our members will use with pride. “The Rhinos” will be doing business with Mikel in the future and we will be recommending PR to other sporting Clubs (& Businesses). Thank you Mikel for the hard work and effort you put into making our card become a reality. Package just arrived not too long ago, I’d like to say thank you on behalf on AUNSW for providing quality service. Cards arrived a lot earlier than expected, was really unexpected. I’ll be more than happy to do business with PR again in the future and refer you as well. Our thanks go out to Mikel and the team at PR, we put in an order for Business cards, VIP loyalty Cards as well as DL Flyers. We were told it could take up to five weeks for our order to be processed, but within a week we had our business cards shortly followed by our VIP Cards (which look great) and the flyers arrived with time to spare. All of the Products supplied have been professionally done with no stress to us, thanks to Mikel. We will be definitely be doing business with you again. Emma Powell – Committee member, Fremantle Inner City Residents Association. Thank you so much for the cards. I called about 5 companies for a quote before choosing PR, you were the last company I called and by far the most helpful. You also happened to be the best value too – a huge bonus! Hence why I didn’t get a 6th quote! As we are a community group you assisted us with the artwork and had a proof through to us in super quick time. I was impressed with your communication, you work too many hours! Thanks for the cards, received them today, they look great and the service you provided was faultless. The cards arrived last week and they look great. Thank you for the excellent service and assistance for which you delivered from my very first enquiry to the final stage of delivery. If you would like to get more info on our Plastic Business Cards, please complete the form below, hit Submit and we will get back to you the same day usually within 30 mins.